Download The Whirlwind Bridge Practice App! Now you can practice a wide range of bridge concepts, from beginner to advanced, while on the go. 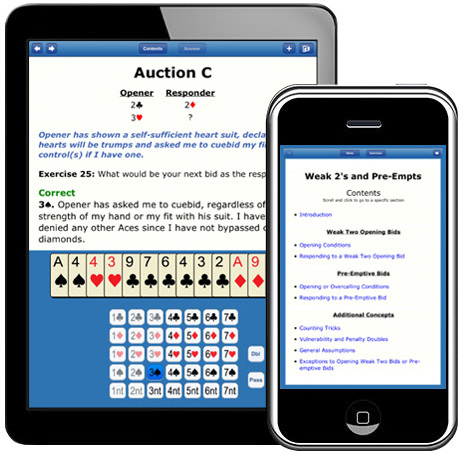 The Whirlwind Bridge mobile app provides dozens of practice hands per concept, covering everything from initial bid through responses, rebids and responder’s rebid. The app works whether you’re online or not. Once you have downloaded, you can practice anywhere, even without cell service. The app is currently available for iPhone and iPad, and our Android version will be coming soon. At the Apple App Store: Search for Whirlwind Bridge and download the app. Questions about the practice app? Workbooks are also available as hardcopy workbooks.